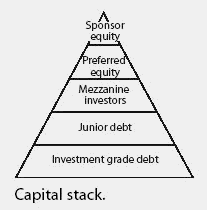 A description of the totality of capital invested in a project, including pure debt, hybrid debt,and equity.The stack is described as containing the most risk at the top,traveling down the stack to the position with the least risk. Higher positions in the stack expect higher returns for their capital because of the higher risk.Lenders and equity stakeholders are highly sensitive to their position in the stack.Typically, the stack is arranged as follows. The Firm has invested in virtually every category of real estate on a global basis, opportunistically shifting asset classes, geographies and positions in the capital stack as it perceives risk/reward dynamics to be evolving. Although cash flow has declined and the loan terms have been modified, the affirmations reflect class A's senior position in the capital stack as well as the significant reserves that can be used to reduce the outstanding debt. The hospitality sector is uniquely positioned at the intersection of being both a real estate and a service oriented business in our opinion and through the combination of our Wholesale RE Funding platform, the Corporate Finance Group and our Capital Markets Group, we are able to service the needs of this industry across the entire capital stack, on behalf of both hotel owners as well as operators, on a holistic basis," said MD, Piramal Finance Limited, Khushru Jijina. HFFs debt team, led by Jeremy Womack, was instrumental in driving yield and ensuring the capital stack met our clients needs. Franco is responsible for all aspects of Hirschfeld Properties' acquisitions program, from identification of target markets and assets, through all phases of the acquisition process, structuring of the capital stack, and asset on-boarding and disposition. With our decades of expertise, we will assist in finding the most efficient capital stack for your project. Red Stone was responsible for securing the debt financing and worked closely with HVPG to assemble the capital stack for the transaction. eProdigy is a FinTech holding company serving the alternative finance industry by providing products, services and a lending platform through its subsidiary companies: Capital Stack, ACHCapital, ACHBanking, eProdigy Loans, and 1Workforce. Khushru Jijina, Managing Director, Piramal Fund Management said, "Omkar remains a preferred partner for our platform and with this transaction, we have demonstrated our ability to remain a perpetual provider of capital across the entire capital stack. Investment sales in the sector continue to benefit from a number of factors, including very strong market fundamentals and capital stack liquidity and "the new mantra of the millennial population looking to rent and not own," the JLL report stated. The original capital stack was comprised of a $375 million first mortgage, $100 million in mezzanine debt held by three companies and $120 million in equity. UC Funding provides financial solutions throughout the entire capital stack, including joint venture equity.